Young State Park’s shortest trail, the White Birch Nature Trail, is it’s most popular during the summer and for good reason. The first half of the 1.5-mile loop skirts Lake Charlevoix, providing easy access to the water and good views of Boyne City and Avalanche Peak towering above the west shore. White Birch is popular among campers and families who want to explore the park beyond the beach and day-use area. The trail is closed to mountain bikes and the walk is short, level and usually dry even in the spring. Despite its name there is no brochure or interpretive signage along the path. 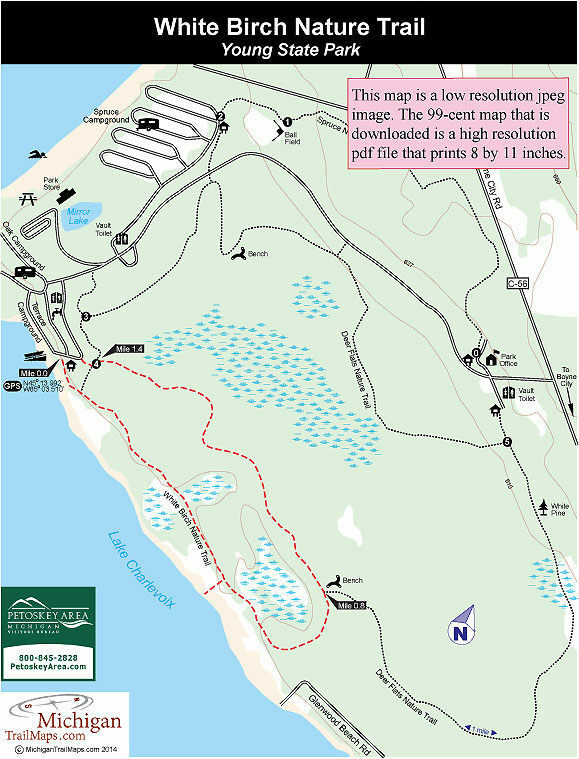 The trailhead for White Birch is located adjacent to the boat launch in Terrace Campground and from the loop begins with the portion along Lake Charlevoix. White Birch departs the boat launch area and immediately begins skirting Lake Charlevoix. This is scenic hiking and at Mile 0.5 you have the opportunity to follow a very short spur down to the water. 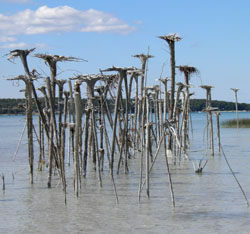 Along the shoreline here are upside forests; stands of cedar trees that have been stuck upside down in the lake with their short, twisted roots reaching for the sky. No doubt an inspired artist created these natural sculptures. The trail begins to swing away from the lake at Mile 0.7 into a forest of cedar and white birch and quickly reaches a junction with a display map and bench. Head west (left) to follow the second half of the loop that remains totally in the woods and at one point uses a series of logs to keep you out of the mud. The trail arrives at post No. 4 at Mile 1.4 where you head left to quickly return at the boat launch.